Carmel, CA, October 29, 2018 – Returning to Chamber Music Monterey Bay after their last performance in April of 2007, MUSIC FROM COPLAND HOUSE is the internationally-acclaimed touring ensemble-in-residence at Aaron Copland’s National Historic Landmark home near New York City, an award-winning creative center for American music (http://www.coplandhouse.org/). Hailed by The New York Times for “all the richness of its offerings” and “illuminating essential truths about music,” MCH occupies a special place as perhaps this country’s only wide-ranging American repertory ensemble. Provocatively uniting past and present, American and non-American, it journeys across 150 years of our nation’s rich musical legacy, reaching back deep into the 19th century and forward to just-completed compositions. MCH has been engaged by Carnegie Hall, the Kennedy Center, the Library of Congress, Yaleand the Smithsonian Institution’s Freer Gallery of Art, among many others. 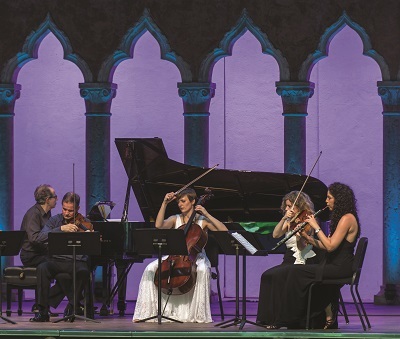 The ensemble records for Arabesque, Koch International, and Copland House Blend labels, and has just begun the 10th season of its popular main-stage concert series at the historic Merestead estate in New York’s lower Hudson Valley. Its live and recorded performances feature a stellar roster of award-winning founding, principal and guest artists. Inspired by Copland’s peerless, lifelong advocacy of American composers and their work, MCH commissions and premieres many new works andalso presents a wide variety of educational and community outreach activities across the U.S. Clarinetist ALEXANDER FITERSTEIN has performed in recital and with prestigious orchestras and chamber music ensembles throughout the world. As a soloist, he has appeared with the Orchestra of St. Luke’s at Lincoln Center, Simon Bolivar Youth Orchestra of Venezuela, Tokyo and Belgrade Philharmonics and many others. A dedicated performer of chamber music, he frequently collaborates with distinguished musicians and ensembles, and performs at esteemed chamber music festivals and societies. He taught at the University of Minnesota, Twin Cities, and is Professor of Clarinet at Baltimore’s Peabody Conservatory. Violinist CURTIS MACOMBER is a member of Da Capo Chamber Players, the Manhattan String Quartet, and Walden Chamber Players and a founder of the Apollo Trio. Previously, he was a member of the pioneering Speculum Musicae, and, as a member of the New World String Quartet, performed on nearly all of America’s leading concert series and toured widely abroad. He is on the chamber music faculty of The Juilliard School, his alma mater, and the violin faculties of both the Manhattan School of Music and Mannes College of Music, and has also taught at the Tanglewood, Taos, and Yellow Barn Music Festivals. Among one of today’s most versatile performers, his extensive discography includes core repertory and critically-praised recordings of hundreds of contemporary solo and chamber works. Cellist ALEXIS PIA GERLACH has appeared extensively in recitals and as a soloist with orchestras around the U.S. and the world. As a sought-after chamber musician, she performs at the Marlboro, Aspen, Bridgehampton, La Musica di Asolo and Caramoor Festivals, and as a Guest Artist with the Chamber Music Society of Lincoln Center. She is a founder of Trio Solisti and the string sextet Concertante. She has also commissioned new works from Kevin Puts, Richard Danielpour, and Paul Moravec, among many others. Pianist and Copland House Artistic and Executive Director MICHAEL BORISKIN has performed in over 30 countries, at Lincoln Center, the Kennedy Center, Carnegie Hall, BBC, London’s Wigmore Hall, among many others. He has appeared extensively as soloist with leading international orchestras and as guest artist with the Borromeo, Lark, St. Lawrence, and St. Petersburg String Quartets, Dorian and Sylvan Wind Quintets, and New York Philharmonic Ensembles, and served as Music Director of Mikhail Baryshnikov’s fabled White Oak Dance Project. He has recorded widely on Naxos, SONY, New World, Albany, and Bridge and is a frequent presence as a performer, host, and commentator on NPR and American Public Media. Living Frescoes was inspired Bill Viola’s 2002 video art installation Going Forth by Day, a series of five looped digital “frescoes” which explore themes of human existence: individuality, society, death, rebirth. The performance will feature a unique multi-media component. Commissioned by Chamber Music Monterey Bay as part of a larger commissioning project entitled The Arc of Life, Living Frescoes was an idea conceived by CMMB Artistic Director Emerita Amy Anderson who commissioned composers Christopher Theofanidis, Joan Tower, George Tsontakis and Kevin Puts to create works related in some way to Mr. Viola’s Going Forth by Day. It was premiered on October 12, 2012 by Trio Solisti, (Maria Bachmann, violin; Alexis Pia Gerlach, cello; Jon Klibonoff, piano) joined by clarinetist Jon Manasse. Ms. Gerlach returns to Carmel for a second performance of Living Frescoes as a member of Music for Copland House. Please contact Tammy Moore at tammy@dworkincompany.com for additional quotes or interview opportunities with the artists. Music from Copland House will visit Monterey High School on Friday, November 2 for two interactive student outreach sessions with music teacher Bob Aguilar and his music students in advanced and beginningstring classes as part of Chamber Music Monterey Bay’s Visiting Artists Outreach program. Kids up Front and Free! Students in grades 3-12 and music teachers receive FREE tickets. $15.00 discounted tickets are available for their adult companions through Chamber Music Monterey Bay’s education program. Experience the concert up close. Chamber Music Monterey Bay has announced another exemplary five-concert series for the 2018-2019 season and is offering sponsorship opportunities and seeking advertisers for its season program. Carmel, CA, August 03, 2018 — Chamber Music Monterey Bay has announced another exemplary five-concert series for the 2018-2019 season and is offering sponsorship opportunities and seeking advertisers for its season program. Chamber Music Monterey Bay enjoys a loyal and mainly local subscriber base of 220 individuals and the vast majority of CMMB’s subscribers (86%) reside on the Monterey Peninsula. Single ticket buyers are a mix of locals, visitors and part-time residents. Concert attendance varies and is approximately 300-450 per concert at Sunset Center in Carmel. The program is 5.5 inches by 8.5 inches, features 32-36 pages and 1,500 copies are printed to be passed out at concerts. Prices start for as low as $275 for a quarter-page ad up to $1,200 for the back cover for the full five-concert season. Camera-ready artwork and payment are due Aug. 31st? CMMB’s 2018-2019 season of five concerts features some of the finest chamber ensembles around the world, opening with up-and-coming French ensemble Van Kuijk Quartet on Oct. 6, 2018. The season continues Nov. 3, 2018 with keepers of the Aaron Copland flame, Music from Copland House; followed by the multiple award-winning Borromeo String Quartet with acclaimed clarinetist Richard Stoltzman on Jan. 19, 2019; with the Catalyst Quartet, comprised of top laureates and alumni of the internationally acclaimed Sphinx competition, on Feb. 23, 2019: and the Montrose Trio, a collaboration of pianist Jon Kimura Parker and the Tokyo String Quartet, concluding the season on April 6, 2019. Founded in 1966, Chamber Music Monterey Bay has its roots in an organization begun by Hazel Watrous and Dene Denny — two pioneers of early California history who brought music performances to the Monterey Peninsula in the mid-1920s who co-founded the Carmel Bach Festival and the Carmel Music Society, which often featured new works by local composers. For sponsorship opportunities or to advertise in the program, please call (831) 625-2212 or email: execdir@chambermusicmontereybay.org.